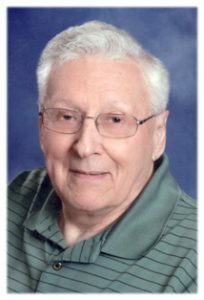 Noel J. Stemper, 83, of Hartford, WI formerly of Port Washington, WI died Sunday, December 23, 2018 at Lawlis Famly Hospice in Mequon, WI after a battle with mesothelioma. He was born August 5, 1935 in Fredonia, WI to Lester W. and Mildred B. Noster Stemper. He graduated from Port Washington High School and started working in construction. He was drafted into the United States Army in 1958 and served in Germany. Upon his return to the United States he continued working in construction. He married Nancy A. Retzer of Port Washington, WI on July 9, 1960. He started working at the Wisconsin Electric Power Plant in Port Washington, WI. He retired after 32 years in 1997. After many years in Port Washington they moved to Hartford in 2004. He loved his family, fishing, hunting and building things with wood. He is survived by his daughter Carol (Darren) Zastrow of Milwaukee, WI three granddaughters Joan, Jessica and Jennifer Zastrow and great granddaughter Alexa. Further survived by brother Carl (Marion) Stemper of Tomahawk, WI nephews, other relatives and friends. He is preceded in death by an infant son, his wife Nancy, daughter Mary, his brother-in-law James (Esther) Retzer and a nephew Jeffery Stemper. A Mass of Christian Burial will be celebrated at 5PM Thursday, December 27, 2018 at St. Peter Catholic Church, 200 E. Washington St., (Hwy 175) Slinger, WI. The Reverend Rick Stoffel will be the celebrant. Entombment will take place in St. Mary’s Cemetery in Port Washington, WI. Family will receive friends Thursday from 2:30 -4:45PM AT CHURCH. Memorials are appreciated. Information and condolences available at www.poolefh.com. Poole Funeral Home, Port Washington, WI (262-284-4431) assisting the family.